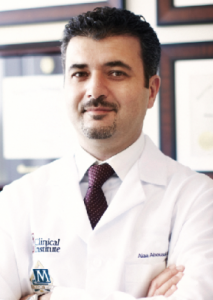 Dr. Abousaif is a board certified internist and Gastroenterologist, who has been in private practice for the past eight years. He has completed extensive advanced training in treating a multitude of digestive disorder and possesses the expertise in utilizing the latest technology to accurately diagnose and treat a full range of digestive problems. Given his excellent bedside manner and caring personality, many physicians, nurses and health care providers in the community trust him with their own health care needs. Fellowship: gastroenterology, Georgetown University and the National Institutes of Health (NIH), Washington DC. Residency: Internal medicine, Wright State University, Dayton, OH. Medical School: Damascus University, Damascus, Syria. Publications: many articles in peer reviewed medical journals and scientific presentations in local and national meetings. Since gastrointestinal disorders can create a great deal of worry, anxiety and discomfort, I strive to provide top quality medical care in an efficient, patient friendly and compassionate environment. Utilizing the latest in technological advances and knowledge, the care will be tailored to each patient’s condition and special needs. I strongly believe that patients come first, and those who choose my practice should feel that their concerns and questions are adequately addressed and answered in a supportive way. I welcome and encourage patient participation in their health care as I believe proper education is the foundation of good health. I am very respectful of patient time and privacy. In my practice every effort is being made to ensure easy access, and to minimize waiting time. Patient feedback is always welcome.